Jacob Branson and other Free-State men became angry when the Pro-slavery authorities took no action when Charles W. Dow was killed by Franklin N. Coleman, a Pro-slavery man, in late 1855. Branson made threats against Coleman. 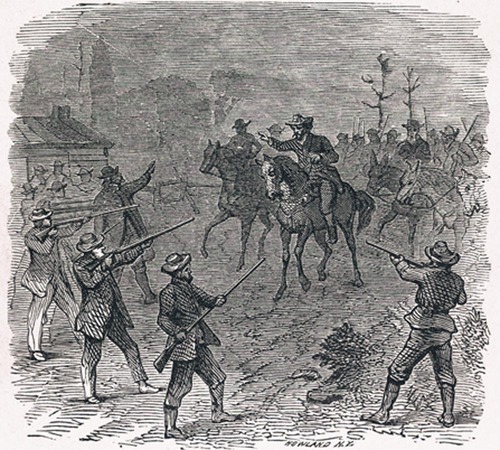 A Pro-slavery posse headed by Sheriff Jones arrested Branson at his home, but a group of Free-State men rescued Branson near the Wakarusa River south of Lawrence. This illustration depicts the "Rescue of Branson," and was copied from "History of Kansas" by J. N. Holloway.